Of all the islands, tiny Paradise Island’s Cabbage Beach is considered one of the best Bahamas beaches. 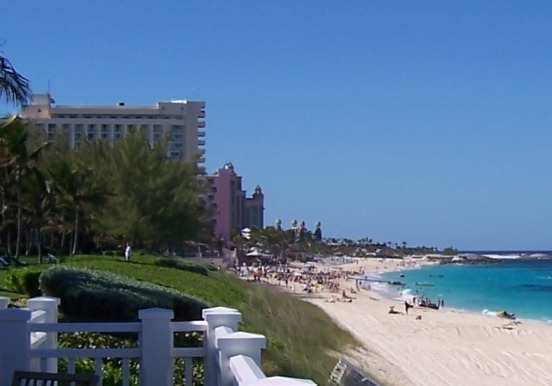 Running from the Atlantis Resort at its western edge all the way east past the Paradise Island Beach Club, this exquisite white sand beach provides a lovely setting for a stroll. Enjoy the emptiness and cool air in the early morning or evening. During the day, sunbathe, rent a Jet Ski from one of the numerous operators, or relax in the shade with a good book. The water tends to be a bit rough, especially in the winter. You’ll find lifeguards on duty near the Atlantis resort. Take not of the flags denoting the condition of the surf: A red flag means the current is too strong for swimming, so you should stay out of the water. Also, you won’t find any public restrooms, so it may be wise to patronize some of the beachside bars or restaurants in order to use their facilities. The crowded area near the western public access road next the Riu.